Sakai Guides and DocumentationStudent Guide Creating Accessible ContentHow can choices in background and text color affect accessibility? Many users will have visual impediments that will require good contrast in the documents you are producing. The best way to help these users is to make sure that the contrast between background and foreground has a ratio of 4.5:1 or higher. Leaving the defaults of the editor intact is best - black text on white, with a ratio of 21:1. The image above contains examples of text with varying contrast ratios, and indicates whether the level of contrast would be adequate. If you need to edit the text color, click on the Text Color button, which resembles a letter A with an underline: A. To edit the background color of the text, which displays as if you had highlighted the text with a highlighter, click on the Background Color button to the right of the Text Color button. The Background Color button resembles a solid black box containing a white letter A.
Clicking on either of these buttons will display a Color Picker, from which you can select a color, such as Black or Maroon. Yellow is a Background Color commonly used to highlight text. Click on a color to select it. Check your color selection for adequate contrast. Click on the More Colors... option in the Color Picker. A Select color window will pop up. At the rop right of the window, your selected color will be displayed under Highlight. Under this box with your selected color, you'll see a 6-digit hex number, starting with #. This is the number that allows the internet browser to display the selected color. Record the the 6-digit hex number for the color you have selected. 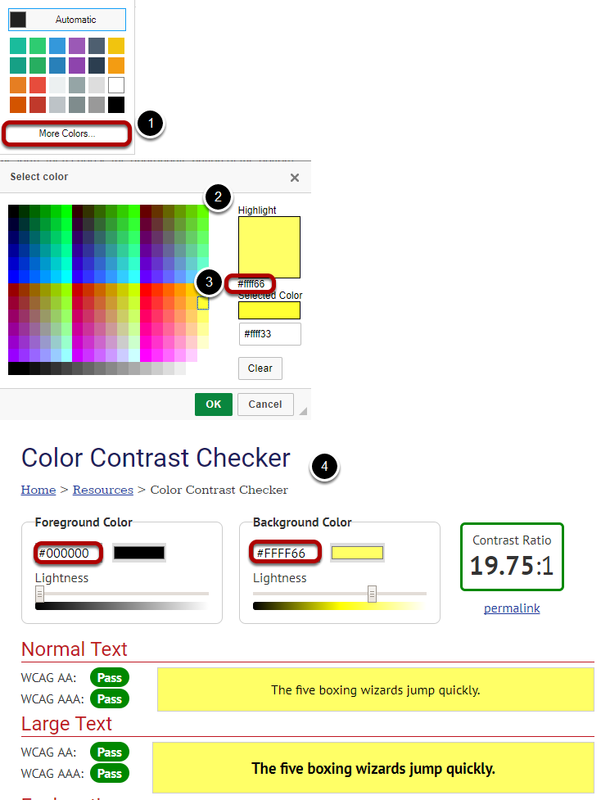 Using an online tool such as WebAIM's Color Contrast Checker, check how the Text Color you've selected contrasts with the background color behind your text (if you're selecting a Text Color) or how your selected Background Color contrasts with the color of your text. To use WebAIM's Color Contrast Checker, enter the hex number for your text and background colors into the boxes provided. The contrast checker will tell you the colors Pass if they have enough contrast. Next: How can I structure my document to make it more accessible?